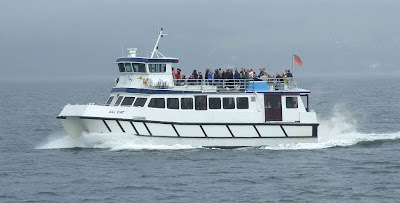 As usual, the Cowal Highland Gathering was held at Dunoon on the last weekend of August, and resulted in additional capacity being provided on the ferry services from Gourock. 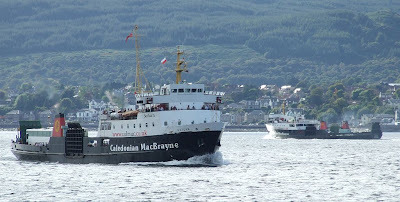 This year, the hourly timetabled Caledonian MacBrayne sailings were augmented when the regular ferry JUPITER was joined on both Friday 24 and Saturday 25 August by her quasi-sister SATURN, taking a break from her summertime duties as the extra Arran ferry. Joining the two 'streakers' as they are affectionately known, was the little passenger catamaran ALI CAT, which provided additional sailings on the Saturday, and she is seen here filled to capacity on one of her crossings to Dunoon. As she has done for the few years now, the paddle steamer WAVERLEY sailed directly from Glasgow to Dunoon on the Saturday morning, before retracing her steps back to Greenock and Helensburgh for another complement of passengers. Following her afternoon cruise to Rothesay and Tighnabruaich, WAVERLEY then returned via Dunoon to Greenock and Helensburgh before heading back to Dunoon, collecting her Glasgow passengers, and taking them back up-river. She is seen here passing McInroy's Point at speed on the final leg of her journey that night after a busy day.